MicroPlace offers investment opportunities in India through Oikocredit, the world's largest private financier of the microfinance sector. For the first time, everyday people can make investments in India's working poor by leveraging the power of microfinance, and earn a return on their investment. A number of Security issuers sell securities on MicroPlace, and use the funds generated to invest in microfinance. Security issuers are responsible for making interest and principal payments to the investor. An investor can invest a minimum of a $100 and buy these securities and that money is used to invest in Microfinance companies . The security issuers are responsible for the principal and interest payments to the individual investor. MicroPlace is a registered broker-dealer with the Securities and Exchange Commission (SEC), a government agency that sets rules for the securities industry. Being registered with the SEC allows Microplace to sell such securities to individual investors. 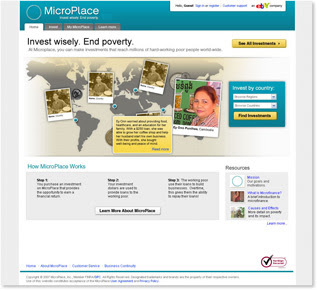 MicroPlace currently charges a fee to the organizations that offer investments through the MicroPlace website. This fee covers MicroPlace’s costs to support the website, provide customer service and be compliant with security regulations. MicroPlace does not charge any fees to the investor. Currently Microplace is allowing investors seeking to invest in the India microfinance industry with the opportunity to invest in the Biswa MFI at 1.5% for 36 months (till 2-29-08)and the IIRM MFI(2-15-2008) at 2% for 15 months. When I heard about this company my initial reaction was that the company is a Kiva.org clone; but a closer analysis shows that the business model between Kiva and Microplace is fundamentally different with the only similarities being that they both operate on the internet and invest in the Microfinance sector. Kiva is a non-profit organization while MicroPlace is a licensed broker dealer. Click here to read about all the differences between kiva and Microplace. With the power of ebay in the business world, Microplace is well positioned to be a global marketplace for such securities. As social investors increase around the world and such companies are launched ,millions are expected to flow into the microfinance sector creating sustainable economic development for millions of poor people around the world.